What a shock! Senator Debbie Lesko is a liar, but then, you already knew that. Lesko is the prime sponsor of the school “vouchers for all” bill, SB 1431, claiming that vouchers will save the state money. This right-wing ideologue is no economist, and those who get paid to know such things beg to differ. The Joint Legislative Budget Committee (JLBC) has issued a report that says the “vochers for all bill” will actually increase costs to the state and will not result in a savings as its prime sponsor is claiming. Don’t you just hate it when they call you out like that, Debbie? Making vouchers universally available to pay for all children to attend private and parochial schools will actually increase costs to the state according to a legislative budget analysis and not result in a savings as its prime sponsor is claiming. The report by the Joint Legislative Budget Committee figures the state will shell out an extra $13.9 million by 2020 if 2.6 percent of students move from traditional public schools to private schools. But that’s only part of the issue. SB1431 also would allow parents of kindergartners to get vouchers without ever having to first enroll their children in a public school and without any evidence of whether they were going to put their children in private schools anyway. And the report puts the cost of providing vouchers for them at another $10.6 million above what the state would otherwise pay to educate them in public schools, putting the total pricetag by 2020 at $24.5 million. Even that may not be the end: If more than 2.6 percent of parents are interested in getting $5,600 vouchers — formally called “empowerment scholarship accounts” — the hit to the state treasury would be even higher. And budget analysts warn there are other changes in the legislation that could boost even further the number of students seeking vouchers. The report comes as SB1491 to create universal vouchers by 2020 awaits a vote in the full Senate and the House is poised to vote on HB2394 with identical language. 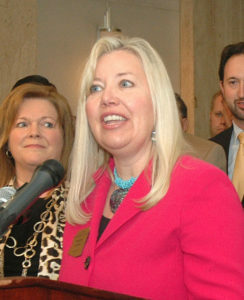 Sen. Debbie Lesko, R-Peoria, is promoting the plan as a method of saving money. She says it takes $9,529 to educate a typical child in Arizona public schools. That, she argues, makes the $5,600 voucher for a non-disabled student a bargain. But the report says that figure includes what schools get in both federal dollars as well as what they raise from local taxpayers. When just the cost to the state is considered, vouchers are more expensive. This report will give new ammunition to foes who contend vouchers further drain dollars from a public school system that is inadequately funded. It isn’t just that Arizona is near the bottom of all states in the amount of aid it provides for students. There also is the low teacher pay, a factor that state School Superintendent Diane Douglas said causes 20 percent of new teachers to leave within the first year and another 20 percent the second year. Lesko told Capitol Media Services she will not comment on the report until meets with the budget analysts who prepared it. But Lesko said she will not abandon the legislation even if there is a net cost to the state budget. Of course not, that’s what makes Lesko a right-wing ideologue. The Senate vote could be close: While Republicans holding a 17-13 advantage, Sen. Kate Brophy McGee, R-Phoenix, already is opposed. That could leave Sen. Frank Pratt, R-Casa Grande, as the deciding vote. And Pratt said Wednesday he has not yet made up his mind. At the heart of the financial issue is that vouchers are equal to 90 percent of what the state would pay in aid to send a child to a charter school. The state gives more to charters than to traditional public schools because they do not have access to local dollars and bonds. So if a student uses a voucher to move from a charter school to a private one, the state saves $600. But the report figures it costs the state an extra $800 for each student who uses a voucher to leave a public school. Lesko noted that current law limits the number of vouchers to no more than one-half of one percent of the approximately 1.1 million students in public and charter schools, or about 5,500. But that cap self-destructs in 2020. Using that presumed 2.6 percent migration from public schools, the report figures that there would be 25,400 students moving to private schools with the aid of vouchers, at a cost of nearly $13.9 million. And if it turns out that 5 percent of public school students want vouchers, the cost approaches $26.8 million. The report also estimates there would be 2,600 kindergartners who start out in private school and whose parents would take the vouchers to help defray their costs. Since they never attended public schools — and perhaps never intended to go there — there is no savings in what would have been state aid. That adds another $10.6 million to the price tag by 2020. But here, too, the report says the costs for kindergartners could approach $21.6 million if more parents opt for vouchers. And remember, this is a Tea-Publican controlled legislature whose dogmatic commandment is “Thou shalt never raise taxes,” so how do they intend to pay for these additional education costs when they won’t raise taxes to support pubic education now? Their only option is to cut all other government services so they can steer public tax dollars to for-profit private and parochial schools (and those who profit from them, like Senator Steve Yarbrough). Contact your state legislators and tell them to kill these unconstitutional bills, SB 1491 and HB 2394, Stop the insanity! What a basket of horse poo. Lesko always references saving to taxpayers, not savings for every bucket of funding. There is a huge savings to taxpayers, on the order of $4,000 per student. But, that is not the biggest savings. We can begin to evolve our education system from one in which the poor and minorities don’t have a chance of getting an education to one in which no occupation is out of their reach. This is what you and I both believe in – that every child should get a great education. But, your insistence on only allowing district schools to deliver that education ends up denying millions of children what you profess to believe in. As Steve has mentioned, district education has had over a hundred years to deliver on that promise and it has failed minorities, children from poverty and children on welfare miserably. And, there is no light at the end of the tunnel. Education productivity of schools collapsed 15% since 2000, 5% just in the last 4 years under Obama’s race to the top policies. After 13 years in district education, the typical child from a welfare family can’t say 9 when you say 5+4 and reads so slowly that they can’t comprehend sentences more than 8 words long. Are you being an ultraconservative racist who demands that education be delivered the same way it has been delivered for 200 years? Quit it! and allow these children of color and poverty to escape district education and have a chance in life. School choice has been wonderful for Arizona. Murders by juveniles are down 90% and we had the highest combined math and reading gains in the nation from 2011 t0 2016. Our African American 8th graders placed first in the nation in math, our Hispanics placed 11th and our white students placed 6th. That’s just an apples to apples comparison on demographics. If we could extend that to family income, we would understand that our real performance is even better than that. But, being number one is meaningless because we are only number one in delivering a horrible product: district education. That classical classroom: lectures by a teacher, quizzes on friday, frequent tests doesn’t work for at-risk students. They need something much more powerful and they will never get it if we allow district education to maintain its strangle hold on public education delivery. 1. Click on the yellow button, “Scale Score”, under “Black”. You will see that Arizona ranks number one of all the states in 8th grade math. 2. Click on the yellow button, “Scale Score” under “Hispanic”. You will see that Arizona ranks number 11 of all the states. Go back to the top and repeat the sequence, selecting white for ethnicity, and you will find that Arizona ranks 6th for white 8th graders in math. Do the same sequence for 2011 and you can see how dramatically Arizona improved under my leadership. Oh John… you’ve pretty much admitted that your goal is to undermine the entire concept of public education. The logic doesn’t follow your claim that you’d like “all children to get a great education.” That can’t happen if public education is destroyed. Further, undermining of education as a public good — available for all families and their children — is about taking control of the curricula away from duly elected bodies (i.e. legislatures and school boards) and giving them over to the same influences that are now buying influence in our state universities (Koch/Ayn Rand “free market” focused) which have already severely eroded the very concept of the value of public goods. Poor families need good public schools IN THEIR NEIGHBORHOODS, not on the edges of town where they can’t go because they don’t have a car or they can’t take two hours to ride the bus one way and two hours back (with transfers it can sometimes be that long). In addition those poor and middle class families with children with disabilities are not often accepted at private, for-profit, schools. They need good schools with small class sizes and well-qualified teachers too. What we are seeing is the re-segregation of American schools with poorly funded public schools for poor black and brown kids and well-funded private schools receiving public monies for rich white kids. If you really wanted to do something about good schools you would make sure that all schools receive proper funding for infrastructure (buildings, air conditioning, meals, cleaning and maintenance staff) AND make sure that schools, regardless of location had the funding to pay for enough good teachers so that class sizes can be reduced. And you would improve teacher salaries and benefits in order to stop the brain drain that is occurring throughout Arizona asour best teachers pack up and move to states that will pay them a living wage. This whole business with charters S a bait and switch that is meaningless to the majority if students. The one party dictatorship has never let facts or accurate data cloud their ideology. We believe therefore it must be true. Because I’ve seen her speak, and she’s not very bright, so maybe she’s just really bad at math? Did you ever think about that? In my experience, once you really look into an issue, there are other things to consider. Maybe it’s not that Lesko is a liar, maybe she’s a big dumb lying idiot.